The Pakistan Army has been looking for new aspirants to Join Pakistan Army As 2nd Lieutenant in the Pakistan Army. Pakistan army has announced PMA course for recruitment and selection and this is a good chance for every young Pakistan to join as the second lieutenant. The majority of Pakistanis boys wish to sacrifice their life for the country and this is the opportunity for them to fulfill their dreams. 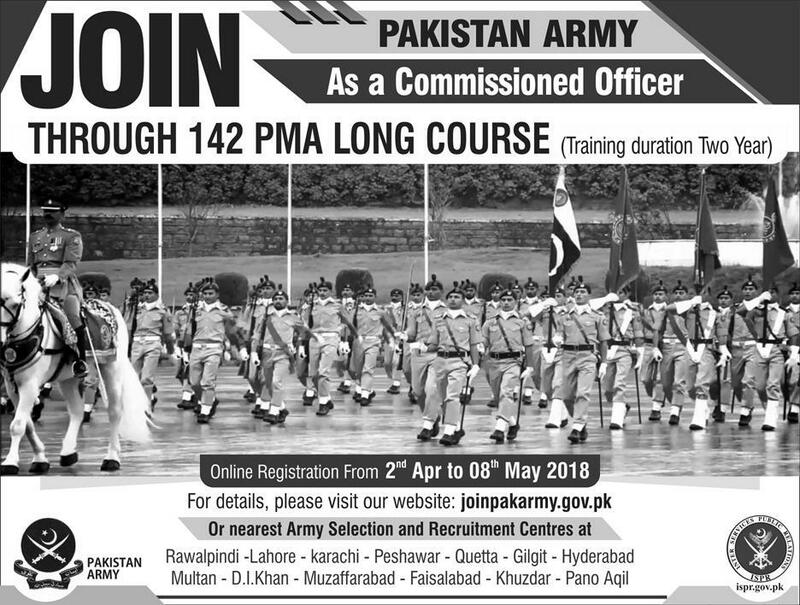 All the applicants having intermediate or equivalent qualification with the age of 17-22 years are eligible to apply for the long course in the Pakistan Military Academy. However, 03 months relaxation in age is in lower and upper age limit. Graduates who are already serving in Pakistan Navy or Pakistan Air Force with the age of 17-23 years can also apply for selection in Pakistan Army. Such applicants are allowed 03-month relaxation in upper and lower age limit. Graduates with 04-year graduation program with BA / BS /BBA or BPA are given more relaxation in their age and applicant from age 17 to 24 are allowed to apply for the long course of PMA.Already serving soldiers with the age of 17-25 years can apply for the long course of PMA. Applicants who are already working in the Armed Forces or unmarried civilian are eligible to apply for 2nd lieutenant in Pakistan Army. All citizens of Pakistan holding domicile of Azad Kashmir and Gilgit-Baltistan can apply for the long course. However, citizens with dual nationality have to surrender their foreign nationalities to be finally selected. Applicant must have a minimum height of 5′ – 4” and the weight proportionate to the height of the applicant are eligible to apply. Candidates having FA/Fsc degree or equivalent should have at least 60% marks to apply for the course. Candidates with 60% marks in BA/BSc/BBA or BPA and 50% marks in FA/FSC are eligible to apply for the long course of PMA. Candidates from Balochistan, Azad Kashmir, FATA, Manshera, Umerkot, Chitral, Tharparker and Areas of Interior Sindh with aggregate marks of 55% instead of 60% are allowed to apply in the PMA course. Already serving soldiers with 50% marks in FA/FSC are eligible to apply for the course. Those candidates who have passed the part 1 of their intermediate examination with 60% marks and waiting for the result of Part 2 can submit Hope Certificate duly attested by the head of their respective institutions. All the candidates who have not received their original certificates of Matric/FA/FSC and BA can get a verification certificate from their respective Board/University to submit along with other documents. Candidates who have qualified their A levels with 60% marks don’t need to submit any equivalence certificate. A student is considered ineligible if he is rejected by any of the Armed Forces boards. Students are unfit by any Medical Board. Candidates diagnosed with Hepatitis B and C are ineligible. If a candidate is removed/dismissed from Government Services and Armed Forces is ineligible. If a candidate withdrew from training by the Armed Forces on any grounds. A candidate convicted through any Court of Law. All the candidates will have to pass the written and intelligence tests of multiple questions. Candidates qualify the written and intelligence test will undergo from physical and medical tests to further qualify for the interviews. Candidates have to complete 1.6 Km distance in eight minutes, complete 15 push-ups, 15 sit-ups, and chin-ups in two minutes. All those candidates who qualify all the tests will finally be called for ISSB test at different Armed Forces hospitals and will be finally selected by GHQ. Thanks for visiting our site which is compatible of Universities Admissions, Opportunities, and details. We provide the best information about How to Join Pak Army As 2nd Lieutenant 2018. You will apply in next induction which will announced in the month of May/June 2015. What about the registration of 136 PMA L/C? New Registration will be started in the month of MAY/June. Can I test next year ..
M a Student of 1st year. .
You apply as a Officer in Pak Army after 2nd Year. But I want to join army as 2nd lieutenant. .. Application status has been approved soon you wiat for 2 or 3 days after registration. Female apply in Pak Army after BS Degree for captain rank. List of degree mentioned in the official webpage of Pak Army. Admin i have 55% marks in 2nd year can i join pak army for long course or short course… Please tell me quickely.. Sorry, Mr you need to obtained 60% marks in FSc for appear in PMA Long Course. Sir can you please tell me that females can apply for PMA long course? Female can’t apply in PMA Long course. Female apply as Captain in Pak Army after BS 4 years in specific disciplines which are mentioned in the official webpage of Pak Army. I am 26 years old and i would like to join Pakistan Army what should i do for the admission. Please dont hurt me. Yes, you apply in Pak Army through Graduate Course if you pass graduation. Sir i need a job. I am D.A.E(Civil) diploma holder. Yes, you will eligible to apply for 2nd Lieutenant post in Pak Army through official webpage of Pak Army. sir i am from lahore. i leave nearby lahore cant. plz tell from where i got the form. You apply online through official webpage of Pak Army. I m doing mechanical engineering (7th semetr final year) .. now I want to join PAK ARMY … I also want not to waste my these 4 years.. what should I do?? Dear, Kashif you will apply in Pak Army as 2nd Lieutnant with BS Mechanical Engineering. New Induction should be announced in May/June. You will apply through Join Pak Army official webpage. Sir im in doing HHS part 2 . I have a eyesight problem my eyes number is -1.5 So plz tell me if there is any hope for me regarding admission in Pak Army? If you have not problem with eye sight than medical assistant of Pak Army take your medical test. After this give you final decision either you will eligible to next step or not. Dear, Umair when new induction has been announced then we have updated on the website,. New Induction will be announced in the month of May/June 2015. I love Army Of My Country.. Yes, you will eligible to apply in PMA if your age not cross 22. Dear, Sabir Khan you apply for PMA Course in May/June. So, wait for new induction if you pass FSC with minimum 60% marks. If you have twice rejected from ISSB then you ineligible to apply in Pak Army commission. But if once not recommended from ISSB then you have one more chance to appear in ISSB Test. sir 31 july ko meri age 22 year hojeygi to kiya me pak army as a 2nd lt join karsakta hun? Dear, there is relaxation of 3 months if your age limit is cross to 22. So, new induction announced in the month of MAY/JUNE. Finally, you will eligible to apply in PAK Army. Induction for 136 PMA will announced in the month of MAY/JUNE 2015. You will apply through Join Pak Army official webpage. Sir I got 919 marks in fact. But I have the problem of my eyes. My eyesight is weak. I wear glasses. Can I join army as second leautinant. Pl Sr help me in this regard. Yes, you will apply for 2nd Lieutenant post in Pak Army. Medical Test will finalized your decision either you will eligible or not. You will apply online through Join Pak Army official webpage. I have answered your question. Yes, you will eligible to apply in Pak Army as 2nd Lieutenant on the base of hope certificate. Yes, you will eligible to apply in PAK Army. Their is relaxation for the student of Baluchistan. New Induction date expected to announced in the month of June/July 2015. You apply online through official webpage of Pak Army. Aslamo alykum. Mein balochistan ka bashenda ho.mere result metric 65.71% . Fsc result 52.90% . Bsc 2 years graduation programs result 66.87% .date of birth 21/3/1991 .kia mein l/c join kar sakta ho? Yes, you will eligible to apply in Pak Army as 2nd Lieutant. New induction announced in the month of May/June. You apply online through Official webpage of Pak Army. sir…..15 pushups, 15 sit-ups and chin-ups???????? These are Physical test conducted by Pak Army. So, when you apply in Pak Army than must have physical fit to pass these test. Yes, you will eligible to apply in Pak Army. New induction announced in the month of May/june. You apply online through official webpage of Pak Army. New Registration will be announced in the month of May/June. I’ve passed FSC with 65percent , now I am in b.com part2, can I apply for pma long course ….? Yes, you will eligible to apply in Pak Army. New Induction announced in the month of May/June. sir me army join karna chahta hu ..me FSC se farigh ho chuka ko mera 57% marks he kiy ame army join karna sakta hu? If you want to apply in Pak Army as an officer than you need to get 60% marks in Fsc. Registration for PMA Long Course has been started in the month of May/June. Than if you rejected once than you will eligible to apply in PMA 136. 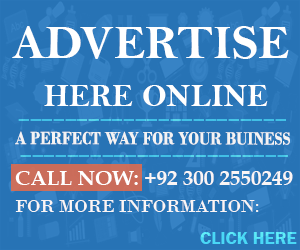 You apply online through Pak Army official webpage. Aoa! Sir I’m really interested to join pak army. I’ve done B.A in 2014. May i apply for 2nd lieutenant? Yes, you will eligible to apply Pak Army in May/June Inductioni. If you want to apply for Technical Cadet Course in Pak Army than you must have 65% marks in FSC Pre-Engineering. Sir i have done my BA and intrusted to join Pakistan Army. i want to know what are the benefits for BA students to join Pak army as compare to Fsc. Yes, Mohammad you will eligible to apply in Pak Army as 2nd Lieutenant. New Induction announced in the month of June/July. You apply on-line through Pak Army official webpage. Student selecting in Pak Army as a officer should avail all facilities including handsome salary package, accommodation, medical facility and much more. Applicants belongs from the area Tharparker and Tehsil Umer Kot will eligible to apply with minimum 55% marks. New Induction announced in the month of May/June. When new induction announced for 2nd Lieutenant than we have updated on the website. sir if i have applied for technical cadet course march 2015… can i apply for 2 leiutenent in may june ??? Yes, you also apply for 2nd Leiutenant PMA in Pak Army. can u plzz give me information about technical course… what we do??? You will eligible to apply in PAF as Aeronautical Engineering course. New Induction for CAE Risalpur announced in the month of Aug/Sep. When new induction announced than we have updated on the website. You apply online through Join Pak Air Force official webpage. New Registration announced in the month of May/June. hope certificate may kam az kam ketne marks display karna chahye ye agar wo marks hasil nahe hote to per kya nikal liya jata hai? In hope certificate it is clearly mentioned that this student has got above 60% marks in FSC. Yes, he will eligible to apply in Pak Army. Yes, you will eligible to apply in the base of MSc. Student having age of 24 and pass Graduation in any field will eligible to apply in Pak Army. Secondly, can you tell me you have study MSc in which field because you have also chance to apply in Pak Army Short Service Commission Direct Captain. I am waiting for your response. sir plz guid me about the pross of joining pak army i am student of 2nd year and i am appearing in exams in may 2015 plz tell me about the admisions of pak army and entry tests of pma kakul etc. New Induction announced in the month of May/June. When new induction announced than we have updated on the website. You apply online through official webpage of Pak Army. Yes, you can change the date of one test. You went to Army select centre and ask for change the date then selection centre coordinator change your admission date. You will eligible to apply on Pak Army on the base of Hope Certificate but you need to show original mark sheet of 1st year. Yes, you will eligible to apply in Pak Army. PMA announced new course in the month of May/June. When new course announced than we have updated on the website. sir i wana know this what will be started PMA 136 admission. PMA 136 induction announced in the month of May/June. Sir mere fsc mai 60% Marks hai uar bsc mai 50% Marks hai dob 04_01_1993 kya mai 136 L/c k lea ay kr skta ho? Select one program from above and apply in Pak Army after MA/MSc. I want to confirm that the candidates with percentage above 60% will be prefered than the rest or not ?? Student who obtained 60% also prefer when applying in Pak Army. Selection of student is totally base of tests conducted by Pak Army. Yes, you will eligible to apply in Pak Army after part 2 exams. You apply on the base of hope certificate if fall in the category of result awaiting students. Sir can females apply for 2nd lieutenant on the base of FSc pre engg? Female are not apply in Pak Army after Fsc Pre-Eng. PMA 136 start in the month of May/June. Sir 2nd lieutenant for females ki vaccancy kab aye g. nd uska eligibility criteria kya hai? Females apply in Pak Army as Captain not as 2nd Lieutenant. Females apply in Pak Army after BS Degree in various courses which is mentioned in the official webpage of Pak Army. Check the navigation bar of Lady Cadet Course. New Induction announced in the month of May/June. When new induction announced than we have updated on the website. i just wanted to know that is there any ( special ) age relaxation for hafiz candidates ? last time i appeared in ISSB for 135 PMA and got not recommended letter ! and now if i apply for 136 my age age as on will be 22 years 6 months and 18 days. I am hafiz so sir any chance ??? If you have graduate degree at this moment than you can eligible to apply in PAK Army next induction. If no then whats this. Sir I had 57% marks in F.sc.. Can I’m eligible Apply for long course..
You need to score minimum 60% marks for apply in Pak Army if you belongs to Punjab. There are some categories region which is mention in Official webpage of Pak Army you check from here. Last Date of Registration 06 May. You apply online through Join Pak Army official webpage. Sorry, Mr Usman you will ineligible to apply in Pak Army on the base of Fsc marks. Secondly, after passing BS 4 years program you will eligible to apply in Pak Army. sir i am a communication designer.or mainy march main 4year bachelor complete kia hai plz ap mujhy bta sakt hain kia main apply kar skti hn army main?? Student having the degree of Designing will ineligible to apply in Pak Army. List of degree mentioned in official webpage of Pak Army through which you will eligible to apply in Pak Army. slam sir meny fsc mn 64% marks hasil kiye hn kia mn apply kr skta hn …. Yes, you will eligible to apply in Pak Army. You must have 60% marks in Fsc-1 for applying in Pak Army. sir last date 6 may hai tu test ktny din bad hoga tel me sir please …. Test date also mention in the post read it clear-fully. Test conducted in the month of June/July. Salam i havr completed my fsc from pakistan 59.45%, then i went abroad now i have completed diploma in business from UK which is equivalent to 2yrs graduation in Pakistan and i have scored “A” grade throughout my diploma… i will get my degree in july or august how shall i apply or what should i do? Yes, you apply as a officer in Pak Army. You need to show your documents where appear for entry test. Secondly, you must show your transcript of result or hope certificate at the time of entry test. Apply online through Join Pak Army official webpage. Thank you for the information. I just have one more question that can i also apply for the graduate course? Do you have any info when is 35graduate course coming? Plus i am out of country so i shall apply form pak embassy right? Yes, you will also eligible to appear in Graduate Course but it’s not confirmed that this year Graduate Course announced or not. If graduate course announced than we have updated on the website. Thanks for the information. I just have one more question can i also apply for the graduate course? Do you have any info when 35graduate course is expected? And i live out of country in KSA so i shall apply from Pak embassy right? Sir… Mujy puchna hy k agr 2 times inter base py ISSB Rejected ho tu wo after Master Apply kr sakta hy Short Course k liye as Caption???? Is their 3rd chance to appear in Short Course as Caption after two times rejection in PMA Long Course?? No, sorry if you twice rejected from ISSB than you will ineligible to apply in Short Service Commission. There is age relaxation for three month if you age limit is cross. But you need to contact with Selection centre of Pak Army for this query. I have 50% in 1st year. Can i apply for 136 LC? No Mr you can’t apply for PMA 136. If you cancelled from one paper than you will ineligible to apply in PMA 136. I have suggest you to apply in PMA 137 starts in the month of Nov/Dec which is favourable time for you. At this time you pass you cancelled paper in supplementary induction. Finally, best of Luck for 137 PMA. Yes, you will eligible to apply for 2nd Lieutenant in Pak Army but after graduation not after Fsc. Yes, you will eligible to apply in Pak Army as Captain. If you proceed study for MBA in Supply Chain Management after B.Com. Is any merit in pak army?? Yes, all student selected in Pak Army on merit base. Sorry, Mr you need to obtained 60% marks in FSc. Sir I want to join Pak Army as a 2nd Lt ,what is the procedure . sir i was not recommended in pma 135lc so what i have to do now? do i have to start this pma 136lc from initials or direct issb kohat? You visit your nearest selection centre and submit ISSB Form for 2nd time. sir i have passed the Bs geology with 78% marks and FSC with 52% marks. Am i eligible for this course???????? Ye, you can eligible to apply for 2nd Lieutenant in Pak Army. A.o.A sir i have passed i.com with 80% marks and b.com 65%.can i apply for the post of 2nd Lt?and when will be come 2nd Lt vacancies? Yes, you will eligible to apply in PMA 136 Course. You apply online through Join Pak Army official webpage. PMA 137 announced in Octo/Nov. So, you have chance to apply in Octo/Nov Induction. I am an airman .my dob is 03-93-1993.registration for PMA long course 136 has been closed and I was not lnformed.now I want to get registration for 136. What should I do.sir do guide me plz.. Sorry, you can wait for new induction announce in the month of NOV/DEc. Induction for next PMA expected to announce in the month of Nov/Dec 2015. But currently, new induction announce for 2nd Lieutenant new induction expected to announce in the month of Nov/Dec. When induction announce than you can apply online through Join Pak Army. Can you tell me that after the month of september which vacancies are opening for girls? sir i have -2.5 eye sighteness so it is okay to join pma course?? will i select? i think there is no one to make a reply? kya fsc wali pre medical kigirls pmz 138 m apply kr skte h?? Its my last year in GCU Lahore,I shall aaply for gorgeous post in 138 PMA L/C. aoa. I have done BS(Hons) in Mass Communication and Media. Can I join Pak army? upcoming PMA 136 long course ki registrartion date kb hai ?? Sir can girls join Pak Army as second lieutenent? i had a query about PMA Long as well as Graduate Course, I’ve done my BA privately with above 60% marks, so would i be eligible being a private bachelor or not? plz help immediately as i have to apply for the recent course. i have 45% marks in matric and i belong from Balochistan can i apply for PMA 141 long course?? I am doing my Fsc in pre medical..am I eligible for long course? Yes, your Are eligible for Long Course. I have done 2 years graduation ..i scored 70% marks in graduation..65% marks in matric.. but 47% marks in intermediate..kindly tell me am i eligible for any course..waiting for your reply Sir..
SIR CAN I JOIN THE LCC AFTER BS ENGLISH? Assalam o Alikum Sr can girls join Pak army as second lieutenent ??? sir i m eligible for PMA……i am doing BBA(HONS) in FINANCE………please tell me??????????? I want to join pak army as a second leautinent ..i have passed my fsc intermediate part 1 with 64% marks now i want to join as a second leautinent on hope base ,kindy guide me . i want to apply for second lieutenant. Please tell me how i apply for it.